Beitr. Sukkulentenk. Sukkulentenpflege 1941, 3 (1941); cf. Gray Herb. Card Cat. Growing habit at Huajuapan De Leon, Oaxaca, Mexico. 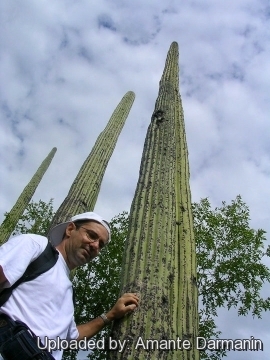 Origin and Habitat: Neobuxbaumia mezcalaensis is native of Mexico (Colima, Guerrero, Jalisco, México State, Michoacán, Morelos, Oaxaca, Puebla, Tlaxcala). The species is common, but patchily distributed. Population density of 1,000-1,680 plants/hectare. It is wide-ranging and abundant, and reaches the highest densities in the Balsas Basin region. Altitude range: This species is found at altitudes from 400 to 2,000 metres above sea level. *Habitat and Ecology: The species occurs in thorny forest and tropical opern deciduous forest among limestone rocks in calcareous soil and in disturbed ares. Neobuxbaumia mezcalaensisis relatively widespread, common, and does not have any major threats. It is collected as an ornamental and for food, but these are not major threats. Description: Neobuxbaumia mezcalaensis is a tall, unbranched columnar cactus up to 10 metres hight. Stem: Solitary, columnar, 5-10 m high, succulent, yellowish green, 13-40 cm in diameter, and bearing lengthways ribs. Central spines: 1-4, slightly flattened, straight, dark coloured, a little longer than the radials. Radial spines: 5-9, spreading, whitish to yellowish, with darker tips, 0.8-2 cm long. Flowers: Often borne along the length of the stem, funnelform, white to yellowish to purple, to 5.5 cm long; pericarpels and floral tubes with podaria bearing bearing small scales and wool. Blooming season: It flowers between March and May (spring). The flowers are pollinated mainly by bats.and they remain open at night for periods ranging from 13 to 15 hours. Fruits: Globose to ovoid, 3-4 cm long, with podaria (tubercles) bearing persistent wool and spines. 1) Edward Anderson “The Cactus family” Timber Press, Incorporated, 2001. 2) Hunt, D., Taylor, N. and Charles, G. (compilers and editors). “The New Cactus Lexicon”. dh Books, Milborne Port, UK. 2006. 3) Arias, M.S., Gama, S. and Guzmán, U. “Flora del Valle de Tehuacán-Cuicatlán”. Fasículo 14. Cactaceae A.L. Juss. Instituto de Biología, UNAM, Mexico. 1997. 4) IUCN. 2013. “IUCN Red List of Threatened Species”. Available at: http://www.iucnredlist.org. 6) Méndez-Larios, I., Lira, R., Godínez-Alvarez, H., Dávila, P. and Ortiz, E. “Proposal for the establishment of the core zones in the Biosphere Reserve of Tehuacán-Cuicatlán, Mexico”. Biodiversity and Conservation 15: 1627-1659. 2006. 7) Ramírez-Padilla & T. Valverde. “Germination responses of three congeneric cactus species (Neobuxbaumia) with differing degrees of rarity.” Journal of Arid Environments 61: 333-343. 2005. 8) Ruedas, M., T. Valverde, J.A. Zavala-Hurtado. “Analysis of the factors that affect the distribution and abundance of three Neobuxbaumia species (Cactaceae) that differ in their degree of rarity.” Acta Oecologica 29: 155-164.2006. 9) Valiente-Banuet, A. “Vulnerabilidad de los sitemas de polinización de cactáceas columnares de México.” Revista chilena de historia natural 75: 99-104. 2002. 10) Hernández, H.M., Cházaro, M. & Gómez-Hinostrosa, C. 2013. Neobuxbaumia mezcalaensis. The IUCN Red List of Threatened Species 2013: e.T152702A667835. http://dx.doi.org/10.2305/IUCN.UK.2013-1.RLTS.T152702A667835.en. Downloaded on 16 February 2017. 12) Valiente-Banuet, A., M. del Corro Arizmendi, A. Rojas-Martinez & L. Domingez-Canseco. 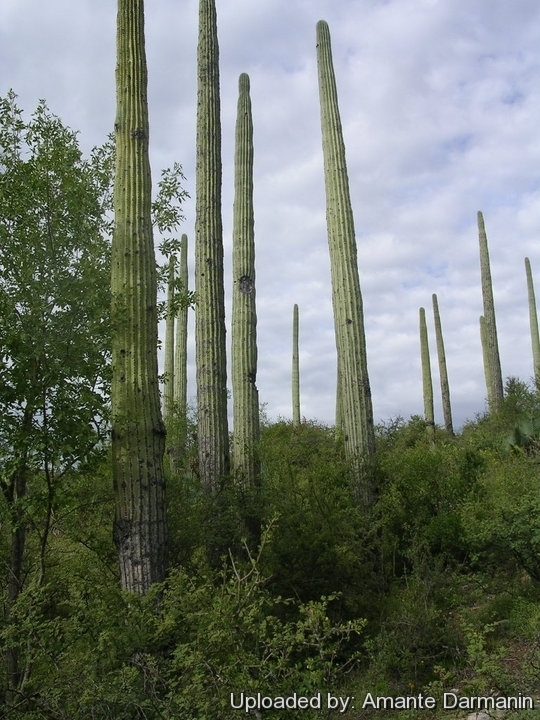 “Ecological relationships Between columnar cacti and nectar-feeding bats in Mexico.” J. Trop. Ecol. 12: 103-119.1996. Propagation: Usually by Seeds (Seeds should be sown in a well-drained soil mix. Surface sowing is the best; seeds germinate in 14-28 days at 25° C, or from cuttings in spring (let them dry till the ends callous well). Then replant them in fresh cactus soil that is ever so slightly moist, and keep it that way till they root).